Mixed Baby Chicks Greeting Card Set Chickens Wearing Hats Hat Photo Note Cards (8) You Choose! Chicks in Hats folded note card set (of eight cards), with the image of a chick wearing a tiny hat. These cards have been printed on card stock and are folded with the inside left blank for writing whatever you wish. Cards have a glossy finish. These cards measure 5.5" x 4.25" and come with a matching white envelopes and are safely enclosed in a cello wrap envelope to protect them. You get to choose the eight cards you like in this set, just choose from cards in stock below and include in "notes to seller" when checking out. 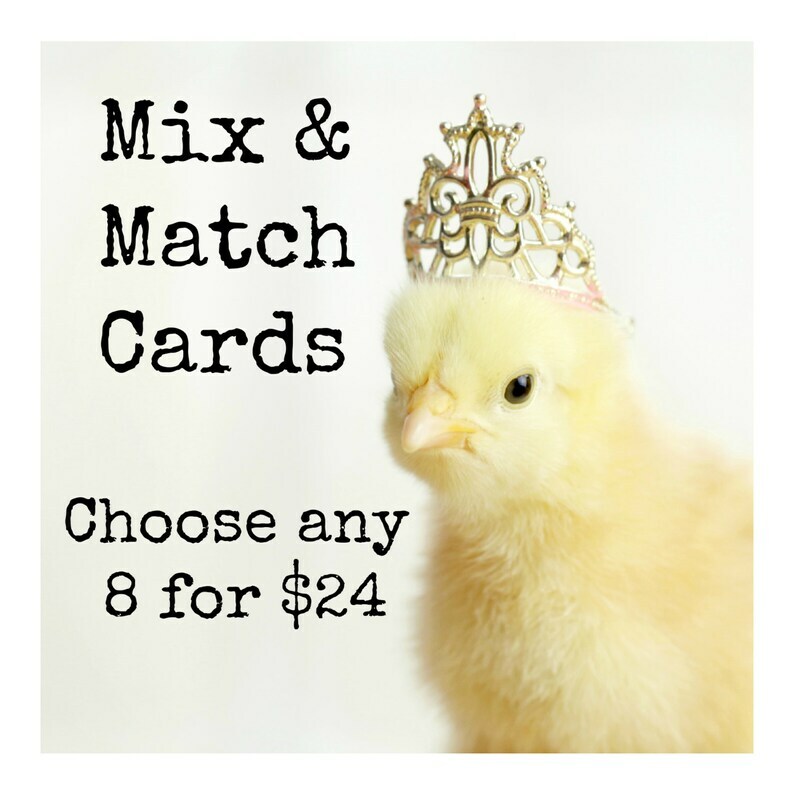 Mixed Chicks in Hats Greeting Card Set Chickens Hats Photo Note Cards (20) You Choose! These cards are great for so many occasions, and are truly unique. I have also bought an assortment of magnets, which will make great stocking stuffers for my oldest child who is graduating and moving out soon. She loves chickens, and every year we hatch a few and enjoy them in our home for 2 weeks before giving them back to the farmer. These magnets will make her smile every day! I can hardly believe how quickly my package arrived and how adorable every single item was. I ordered a variety of cards and magnets. Julie included a couple of extra items and really made my day! Everything is absolutely perfect, and I’m already planning my next order! These cards are perfectly adorable! Love them! !